Last week’s Uefa Champions League tie between Chelsea and Barcelona in the first leg, semi final stage of the competition lived up to the expectation of football fans and pundits around the world. Officiating was top notch and Chelsea deservedly got the win at the Stamford bridge without any controversy what so ever even if Didier Droagba the scorer of the lone was accused of play acting. The previous encounters between these two European rivals have produced entertainment s well as controversies. So we want to look at the rivalry between these two teams and how it all began. Enjoy! A thunderous free-kick from Gianfranco Zola helped Chelsea to a 3-0 first-half lead against the Spanish champions at Stamford Bridge, but Luis Figo’s 64th-minute goal gave Barcelona hope for the return leg. At the Nou Camp, current managers Pep Guardiola and Roberto Di Matteo went head to head in the midfield. Barca took a 2-0 lead but Tore Andre Flo hit back. In extra time a bad night for Celestine Babayaro got worse — he added to his first-half own goal by bringing down Figo in the box and earning a red card. Aggregate 6-4 to Barca and game, set and match. 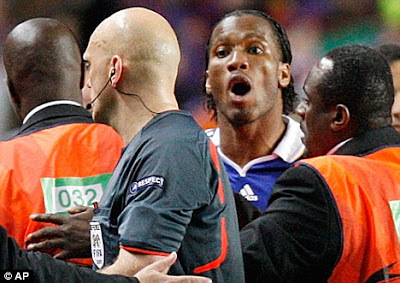 Sweden's Anders Frisk, who refereed the Euro 2000 final, was bullied into early retirement after he and his family received death threats from Chelsea fans for harshly sending off Didier Drogba for a 50-50 challenge with Victor Valdes during Chelsea’s 2-1 defeat at the Nou Camp. Jose Mourinho lost two consecutive games for the first time in his managerial career - following a 1-0 defeat by Newcastle in the FA Cup - and then accused Frisk of inviting Barca boss Frank Rijkaard into the officials’ room at half-time. The Chelsea manager later received a touchline ban for making the claim, but that didn’t matter much to the retired Frisk. Another meeting of the European heavyweights marred by another red card. This time Chelsea defender Asier del Horno finally lost patience with the brilliance of an Argentinian teenager with a baggy shirt and shaggy hair. 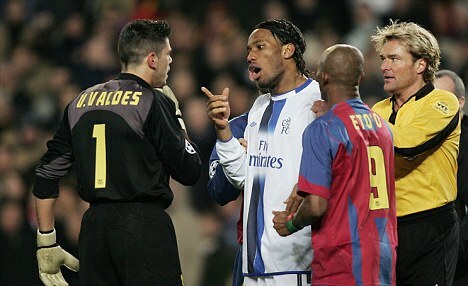 His name was Lionel Messi and he tormented the Chelsea left back from the first whistle. Del Horno lunged in violently, then feigned injury to try to avoid the inevitable red card. John Terry had to step in to protect him as Messi’s team-mates circled. 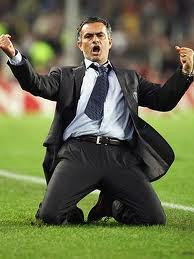 Chelsea lost 2-1 on the night and drew the second leg 1-1 to crash out. Del Horno played only 11 more games for Chelsea. It was ‘only’ a group stage match but the bitterness of the previous season boiled over. 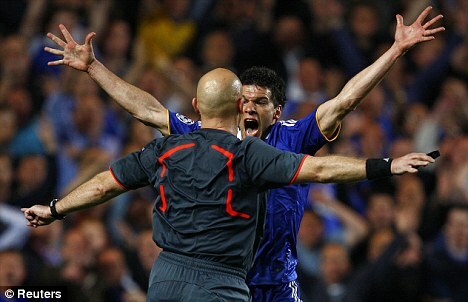 Ten bookings summed up the animosity between the teams and an elegant chip from Frank Lampard summed up the quality. But it was Didier Drogba’s turn and strike in the 90th minute - not unlike his goal against Tottenham on Sunday - that made it 2-2 on the night and secured Chelsea top spot in the group. It also brought a bouncing celebration down the touchline from Jose Mourinho, with a lovely jig - jeered by 95,000 Catalans. One of the most extraordinary climaxes to a match in Champions League history saw referee Tom Henning Ovrebo refuse to award Chelsea a string of seemingly legitimate penalties. The 1-1 draw at Stamford Bridge meant Chelsea crashed out on away goals. Drogba’s claims were crass but at least made in the heat of the moment. Manager Guus Hiddink went further, hinting that there was some sort of UEFA conspiracy by Michel Platini and his pals to keep Barca in the Champions League and prevent an all-English final against Manchester United.